David Raskin (Johnny Weston) is a high school senior who was just accepted into MIT. Unfortunately, his family can't afford his tuition costs. One day while nosing around in the attic, David and his sister Christina (Ginny Gardner), find their deceased father's old video camera and a video of David's 7th birthday, where he notices his 17-year-old self in the mirror at his 7th birthday party. Shortly after, David and his friends uncover a machine in his father's workshop in the basement along with schematics for it written by D.A.R.P. The device turns out to be a time machine. David and his friends reassemble it and try to use it to fix their problems and change the past. Unfortunately, their changes in the past have some unforeseen effects on the future as things start to go awry. As we have stated many, many times on this here blog, BigJ and I are not fans of the found footage genre. Most of the time, found footage films don't work for us. They are erratic and bothersome at best and take us out of the element of a movie because of our need and want to vomit from all the frenetic movement. Most films don't need to be shot in this style, and "Project Almanac" is no exception. While the movie does have a little bit going for it right off the bat, it quickly goes downhill from there. The overall story itself is fine and time travel movies have been done before, but when paired up with the found footage shooting style, a set of rules while will no doubt be broken, teenagers and twirling objects in the air every 5 minutes, it makes for a "meh" experience. As a whole, this movie is uneven and full of holes beyond the paradoxes of time travel and the past, the present and the future. There is a bit of humor and some cool initial scenes to offset all the science-y jargon in the beginning of the film, but none of this helps our lack of interest in both the characters themselves and the love story that is seemingly shoved down our throats not just in this movie, but in every movie. And while we're on the subject of this movie's characters, seriously, David's sister Christina is pointless and seems to be in this movie for blatant cleavage shots as opposed to actual character development. And wouldn't you think after testing said time machine only a couple of times with a result of sending a toy car through a concrete wall that you'd, oh, we don't know, test it a couple more times, you know, for safety's sake?! The thing is, none of this is horrible to the point of walking out, but it's just all really dull and boring. And the ending? Yikes, what a bummer. It had so much potential, but in the end, it felt like it was purposefully left open-ended in case there is a need for a sequel. 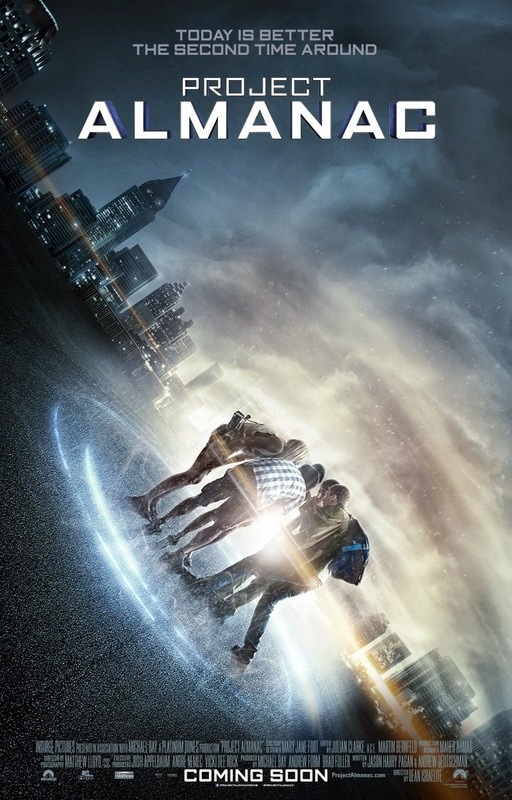 It's hard to make a perfect time travel movie, hell, even "Back to the Future" ain't perfect, but "Project Almanac" seems content in insisting upon referencing all of the better time travel films before it while giving us no reason to think of this movie as anywhere close to good. At the end of the day, this movie is just there, simply something we watched to pass the time. And of course, with a Michael Bay production, you know you're going to get a hefty amount of product placement, too. Let this be a lesson not to let a time machine fall in the hands of grubby teenagers who will most likely muck up the past. The writers have grasped the pop culture mettle fully by the hand and run with it.